As Boston undergoes a renaissance, law firms are being drawn to its shores, ready to capitalize on a booming market. The Boston skyline from the Seaport Boulevard bridge. Two hundred years ago, the area now known as the Seaport District in South Boston was a muddy mess. In fact, until the 1800s, most of it was underwater. The neighborhood has lived many lives in the interim, transitioning over the 20th century from a bustling shipping harbor to a desolate haven for abandoned warehouses. Over the past decade, it’s been reinvented once more, experiencing its own renaissance in line with the changes taking place across industries in Boston. What was a heavy manufacturing town just 40 years ago is now a destination for entrepreneurs looking to capitalize on the city’s burgeoning health care, biotechnology, life sciences and technology sectors. Boston’s financial sector has also blossomed, and its private equity sector is one of the strongest in the nation. All that growth has, in turn, created a booming market for legal services. 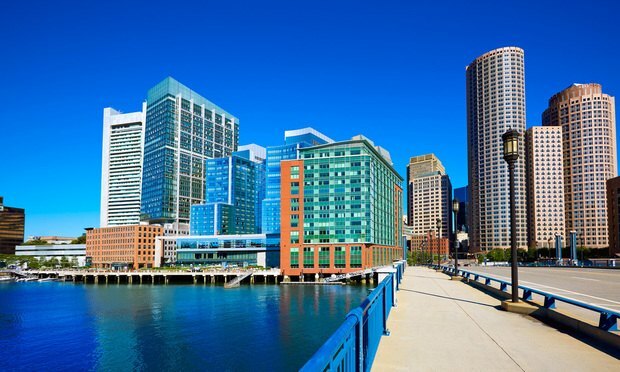 “The current legal market in Boston is a lot like the recently revamped Seaport District—hot, bustling with activity and constantly changing,” says Mary Rosenfeld D’Eramo, vice president of operations at attorney placement firm Mestel & Company. While the Boston legal market traditionally has been dominated by law firms with roots in the city on a hill, this new market for legal services has served as a siren call to out-of-town Big Law firms looking to capture the legal work and talent emanating from the newfound growth. “Boston is home to several practice areas with the highest demand, which distinguishes the market and makes it particularly attractive to firms expanding their platforms further into the Northeast,” notes Rosenfeld D’Eramo. Over the last year, four Am Law 100 firms have established their own outposts in the city, in addition to the nearly dozen that have moved to Boston over the last decade. Kirkland & Ellis was the first of the bunch, opening its own office as a part of its private equity expansion in the summer of 2017. Hogan Lovells followed, announcing a merger with 25-lawyer, Boston-based litigation boutique Collora to build out its health care and life sciences practices. Womble Bond Dickinson picked up a trio of McCarter & English intellectual property partners to open its first office in the city. Earlier this year Quinn Emanuel Urquhart & Sullivan opened its own offices with three of its own IP litigators. And there are more firms on the way, says Rosenfeld D’Eramo. This focus on Boston by national firms has turned up the heat in an already competitive marketplace. A traditionally sleepy lateral market is now highly active, and all the commotion has created more work for smaller firms to pounce on, so long as they are well equipped to answer the call of a changing marketplace. Kirkland & Ellis opened up its office in Boston’s Bay Back neighborhood in May 2017 with three private equity partners from its New York and Chicago offices, a group that has since grown to nearly 40 attorneys. The decision to open in the city was fairly straightforward, says Jon Ballis, a corporate partner and a member of Kirkland’s 15-person global management executive committee. Boston has always been a breeding ground for some of the nation’s top talent. Just as trade is synonymous with the city’s foundation, education has been one of its lasting pillars. In 1635, the first public school in the colonies was founded in Boston and, a year later, the first post-secondary school, Harvard College, opened. Boston is now home to some 35 colleges and universities, including seven law schools. “What’s driving the legal market now [in Boston] and why it’s so attractive to many firms is a very heavy concentration of talent,” says David Chapin, managing partner of Ropes & Gray, which was founded in Boston in 1865 and boasts the city’s largest office with 547 attorneys. The city’s institutions pump out talent that builds the industries—and the attorneys that support them. And while Boston has always been a highly competitive market for legal talent, the influx of larger national firms means that there are more opportunities for newly minted law school graduates or lawyers at firms thinking about their options, Chapin says. Since 2016, there have been nearly 300 lateral hirings in Boston among NLJ 500 firms—a far cry from the quiet lateral market that inhabited the town just two decades ago. A series of dissolutions that began in the mid-1980s and continued through the early 2000s set the city’s lateral wheels in motion. Longtime Boston law firms like Herrick & Smith, Gaston & Snow, Hill & Barlow and Testa, Hurwitz & Thibeault all closed their doors, sending hundreds of attorneys out to search for new firms. “It was really that movement of lawyers that opened the door,” says Andy Sucoff, Goodwin Procter’s Boston office chair. He notes that the firm picked up close to 70 attorneys from intellectual property specialist Testa Hurwitz after its dissolution. Sucoff says that in order to recruit and keep talent in Boston with the new wave of national firms entering the fray, Boston-based firms must remain competitive. In the legal market, like anywhere else, change brings uncertainty. “If there’s one lawyer in town, he gets more work when there’s another lawyer in town,” says John McGivney, managing partner of Rubin and Rudman, a 99-year-old firm located in Boston’s Financial District. When large law firms move into Boston, they become a part of the metropolitan and regional economy, McGivney says. Large firms have their established clients, like private equity firms and international private investors or consortiums looking to invest. Smaller clients, like startups, entrepreneurs or companies seeking investment turn to more rate-sensitive, smaller local firms to handle their affairs, increasing the amount of legal activity across the city and providing firms like Rubin and Rudman with even more business. Smaller law firms have made inroads with the city’s thriving startup community. In 2016 alone, the city was home to 1,869 new startups and was ranked No. 1 in preparedness for the digital economy, according to global innovation network Incubator 1776. Thanks to lower overhead costs, smaller firms are able to offer clients that are just finding their footing a more competitive rate structure than larger, national firms. “They’re often not accustomed to paying legal fees to begin with, and they obviously are looking for competitive rates,” McGivney says. Overhead costs often lead large firms to pressure their local offices to increase rates to Chicago or New York levels. But Boston’s rate structure tends to be lower than those cities, McGivney says. The work flows downstream to smaller firms with friendlier rate structures. The rates also help smaller firms remain competitive on the lateral market. “Those lawyers who are local, who have practices that they’ve developed over a period of years, become extremely concerned, anxious that they might lose their client if they increase their rate to be consistent with the rate structure of those large law firms, [so] they begin to look around,” McGivney says. The environment leads to more lateral moves in the city, further stoking competition over rates and creating a welcome cycle for smaller firms. But it’s not all smooth sailing. To a certain degree, smaller firms do have a cost advantage, but to remain competitive they need to be confident in identifying their niche and recognizing their strengths, says Robert Zinn, a Boston-based legal recruiter with Major, Lindsey & Africa. In order to remain viable in the face of a Big Law influx, they need to be nimble and find opportunities where they exist and take advantage of them.